Home mirrow outfit style MIRROW... E OGGI COSA MI METTO? MIRROW... E OGGI COSA MI METTO? IT Buondì bellezze ormai sono ricominciati i corsi all'università e quindi il tan tram che mi porta fuori casa per gran parte della giornata. Proprio per questo ho pensato di creare una nuova "ennesima" rubrica, di outfit veloci allo specchio. Quindi qualcosa di semplice e veloce per tutti i giorni, non professionale come le istantanee che riesco a scattare nel week end. Ho pensato che questa idea possa essere utile anche per chi tutte le mattine va presto a lavoro o a scuola e non ha tanto tempo per decidere cosa mettere o come agghindarsi. E vediamo immediatamente la proposta di oggi, ho scelto questa tee grigia con stampa di Marilyn Monroe che se ancora non lo sapete è il mio idolo di stile e bellezza. Ogni oggetto o capo che vedo con sue foto lo acquisto, e questa meravigliosa tee non poteva che essere mia. 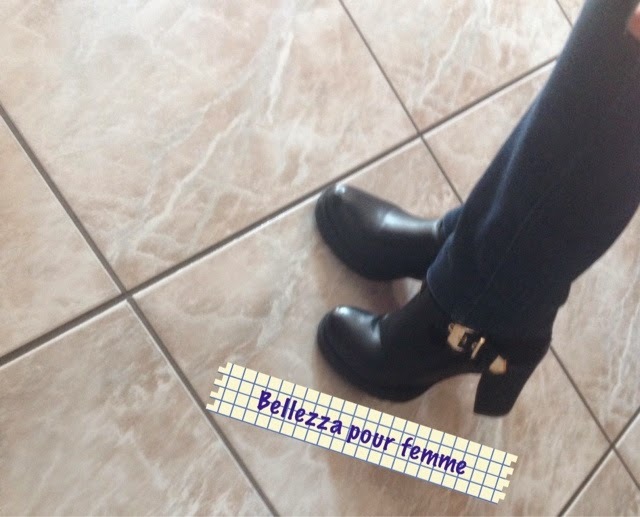 Jeans semplice dal lavaggio scuro e inseparabili ankle boots. Makeup semplice e non eccessivamente elaborato, ombretto luminoso su tutta la palpebra e colore tortora freddo nella piega, tutto rigorosamente dalla mia amata Naked 2 URBAN DECAY. Per la riga di eyeliner e nella rima interna ho usato il matitone duo WJCON 05 in Viola Perlato. 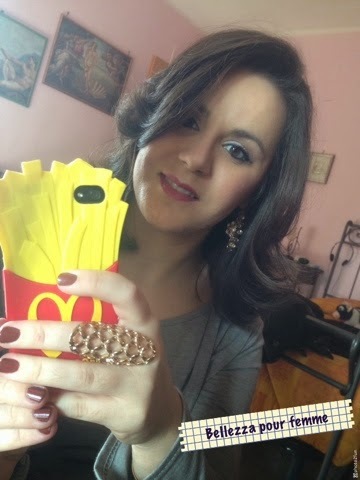 E sulle labbra Precision Lip Pencil 310 KIKO. EN Hello beauties now recommenced courses at the university and then the tan tram that takes me away from home most of the day. Precisely for this reason I decided to create a new "umpteenth" heading, the outfits fast mirror. Then something quick and easy for everyday, unprofessional as snapshots that can shoot over the weekend. I thought that this idea can also be useful for those who every morning goes quickly to work or school and does not have much time to decide what to wear or how to dress up. I hope you may be interested. 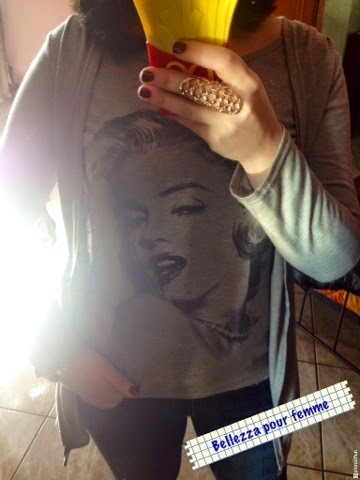 And we see immediately the proposal today, I chose this tee with gray print of Marilyn Monroe that if you still do not know it is my idol of style and beauty. Each object or head I see with his photos the purchase, and this wonderful tee could only be mine. Simple dark wash jeans and inseparable from ankle boots. Makeup simple and not overly elaborate, bright eyeshadow over the entire eyelid and color cold taupe in the crease, all strictly from my beloved Naked 2 URBAN DECAY. For the line of eyeliner and internal rhyme I used the Pencil duo WJCON 05 in Purple Pearl. And on the lips Precision Lip Pencil 310 KIKO. Questa rubrica la amo!!!!!! Sono sempre di corsa e mi è molto utile! Bellissimi gli stivaletti. Marzia ti adoro perché sei una donna fantastica. Bella la tee, mi piace moltissimo!